I had a bunch of apples, and several habaneros lying around. 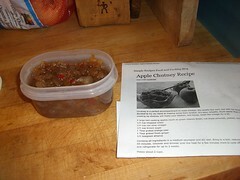 I decided habanero-apple chutney was the way to go. Please note, I took the recipe and added habaneros to it, it didn't have them in there at first. I also omitted the orange peel, added some cinnamon and cloves, and substituted apple cider vinegar for red wine vinegar. How was it? Hot. But not too hot if you like such things. In fact, the heat isn't the most prominent thing like I have had with other habanero concoctions of mine. It goes really well with a sharp cheddar, the cheese cuts the heat rather well. It would also go well with pork but I don't ride that way. Perhaps I'll bring a little in to work, make a platter with cheese and crackers. Maybe I won't warn anybody. I had a student I was tutoring in Spanish once tell me his ill-fated attempt at making salsa for his high school class. The recipe they were using called for jalapeños and they weren't paying close attention when they were at the grocery store and they got habañeros instead. In a way, they were fortunate - they tried it before bringing it in to school. It was so spicy they ended up throwing up.